Edit: and thanks to our sponsors and the supporting members, I'm sponsored to go there - wouldn't be able to visit otherwise so thank you again! Part of my blogs about Being Free is talking about the influence of money on (volunteer) contributors. This is something discussed by a lot of people, so I won't add to this discussion, but it's interesting for sure so I include a few links for those who want to read up on it. For me, it started with this blog about money and motivation by Joe "Zonker" Brockmeier and I initially followed a few links in there. A very early blog about the subject comes from the Gnome community (by Luis Villa) where this issue has been playing for some time. Stormy has also written a few excellent blogs about the subject. Stormy's opinions are worth following in general, and her experience in this area make for some insightful articles. As I kind of promised in my previous blog - here some notes from LinuxTag, worked out in an opinion :D. Now this blog is different from my usual ones. While I do write about strategical stuff, I try to stay away from controversial things. Not this time, sorry. At LT I spoke with quite a few interesting people, including Georg Greve (the dot will feature an interview with him soon) and Matthias Ettrich (who started this whole KDE thing). The latter had a fairly interesting opinion about his 'kid'. After we started talking about stuff not for this blog (mostly politics and economics) we came on the topic of why he started the KDE project. Since then, a lot has changed. That doesn't include the difference in focus between Gnome and KDE - Matthias complained Gnome builds a great user experience on inferior technology, KDE creates super technology while not doing enough on usability. He's not wrong. So KDE has created a very open culture which results in innovation, experimentation and new technology. The user experience, while more of a focus than in the KDE 3.x times, imho still ain't what it needs to be, might never be the way we currently work. At least, the finishing touch is boring and hard to do in such an open meritocracy. You'd need a strongly design-driven development for a finished, consistent experience, were developers follow a common vision laid out by a few brilliant designers. And follow through on the boring stuff. This simply doesn't fit how we work - developers decide on what happens to their applications and what they spend their free time on. So different applications have different ways of solving certain issues (like with the + hover button on folders). This leads to innovation, and in time to better solutions - but while these are fleshed out (and there is always SOMETHING going on) it makes the whole set of apps less consistent, less stable, less usable. Another issue is the large influence users have on how we work. Yes, that's right, I'm blaming active users here for unusable software. Many of our vocal users are powerusers and demand features easily accessible which only 1% of the world needs. And we cater to them, which often leads to a more bloathed piece of software. Especially removing functionality often leads to a big flamewar. Gnome simply ignores those who don't agree with the vision they have, and the end result is at least more consistent. Many in our community hoped the distributions or other commercial parties would be able to pick up where we left, and finish that last mile. They didn't - well, they tried, but every distribution which successfully did so either didn't contribute upstream (xandros) or went belly-up, was bought or had to change focus (mandrake/mandriva, suse). Ubuntu does the last mile for Gnome but Kubuntu lacks resources to do it for us. 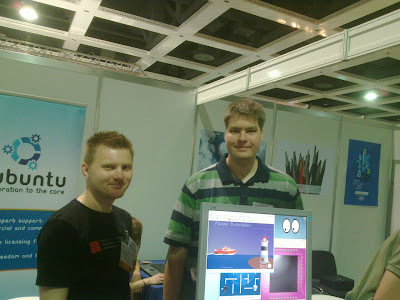 So I finally took a little time to blog about LinuxTag. Still a lot of writing to do/finish (count on a bunch of articles and 1 or 2 longer blogs from me) but I should give a little shout out as to how amazing LinuxTag was. Yes, for me it was amazing. Last year wasn't that useful (even though it was fun, maybe even more than now) but this year we spoke to a huge number of visitors, got quite a few to sign up for the supporting membership (and hopefully convinced many others to sign up later on), got away with a lot of business cards to follow up on and spoke with many other FOSS people. And as usual, there was a lot of hugging. I'd complain if there wasn't (must admit I had to surprise-hug a few ppl - what's wrong with a hug?). Another rule I'd like to institute is "more Lea's". We actually thought about simply putting her in the booth box, but were afraid Daniel wouldn't like that. Lea? Oh, she was amazing... She came with her boyfriend and Amarok hacker Daniel Dewald, and initially was sitting in a corner of the booth, looking around with a face saying "wtf am I doing here". Understandable, of course, if you're not a big geek. 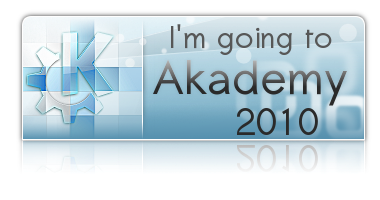 So at some point I gave her the excellent talkpoints we had on paper about our supporting membership program (written by Sebas) which, in bulletpoints, explains what KDE e.V. is, does and why you should support it. Frederik and a few others gave her further info about KDE later on - and she turned out to be a wirlwind, eclipsing us all when it came to talking to visitors. I think over half the people who signed up at our booth for the supporting membership did so because they were approached and convinced by Lea! Now of course I shouldn't dismiss the other people at the booth, I especially think Torsten Thelke (our KDE e.V. intern) did an amazing job, and so did Frederik in his sometimes-scary way. Yes, showing off Fluffy Bunny themed plasma desktops, then jumping some of your fellow booth mates for a hug could be off-putting. Especially for ppl with gay-fobia - I even heard some opposed the Fluffy Bunny project as it might make young boys gay. Interesting concept - I've heard of ppl claiming to be able to 'heal' gay ppl into being hetero, so pink could 'heal' hetero's into gays? Who knows... Either way, a warning for you all - Frederik, despite his hugging and happy nature, is NOT gay, and I would keep your girlfriends away from him as he's quite the womanizer. 2 days ago I wrote about the booklet the KDE promo team has been working on. I noticed a few contributions, really cool! * Add a few succes stories! * On the bottom, help is needed from a developer or someone familiar with development to give some clues on how developers can get involved - more practical things. And some teasers like "phonon makes multimedia easy" or something. * There should be a few more games mentioned in the learn & play section, maybe also some mor edu? * the first page with short texts is not complete yet. This booklet can be a great source of information to people completely unaware of who we are and what we do, and thus make a great addition to booth boxes. Try to look at it from that perspective - if you know little of computers and nothing of KDE, what would you like to know? As you see I've put 'add a few success stories' on top - I think it is very important to show our audience what we have accomplished already. A big deployment or two would rock. I've already written a piece about KHTML vs WebKit, it needs review of course and having more such stories would be great. Special thanks to those who have already contributed - Luca Beltrame, Stuart Jarvis, Justin Kirby, Roger Pixley, Carl Symons, Vivek Prakash, Lydia Pintscher, Valerie Hoh, Pradeepto, Frederik Gladhorn, Daniel Laidig, Eckhart Woerner, Claudia Rauch AND YOU? Feel free to contact me if you have any questions but keep in mind: pretty much anything is useful, really. Having some text to work with makes it very easy for some of us to go in and finish it up (for ex. Carl is real good at that). So just go ahead. Google docs (we're moving to Etherpad but this was started on G-docs) has nice rollback so don't worry about breaking stuff. Again, any help or any comments are welcome!